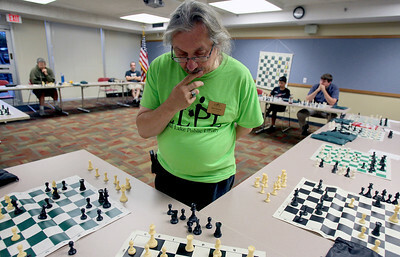 Sarah Nader - snader@shawmedia.com Bob Cairone of Crystal Lake pounders his next move while playing 17 consecutive games of chess during a tournament hosted by the Crystal Lake Public Library on Tuesday, June 26, 2012. 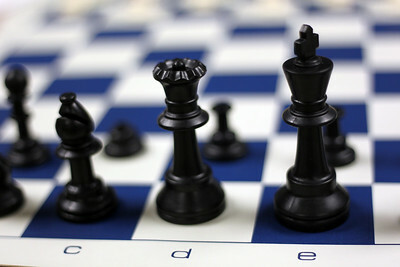 The Crystal Lake Library hosted seven weeks of chess workshops to help learn strategy, positioning and logic before hosting the tournament against Cairone. Sarah Nader - snader@shawmedia.com Paul Sweeney, 8, of Algonquin makes a move while playing against chess champion Bob Cairone of Crystal Lake during a chess tournament hosted by the Crystal Lake Public Library on Tuesday, June 26, 2012. 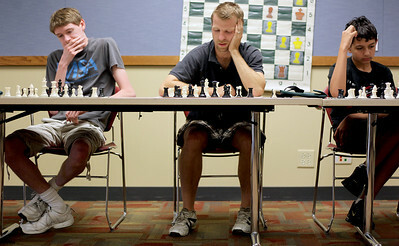 Sarah Nader - snader@shawmedia.com Dan Rosenthal (left), 16, of Fox River Grove, Dave Kerth of McHenry and Brandon Harisis, 13, of Crystal Lake pounder their next move during a chess tournament hosted by the Crystal Lake Public Library on Tuesday, June 26, 2012. Sarah Nader - snader@shawmedia.com Aditya Khandeshi, 10, of Crystal Lake beat chess champion Bob Cairone of Crystal Lake during a chess tournament hosted by the Crystal Lake Public Library on Tuesday, June 26, 2012. 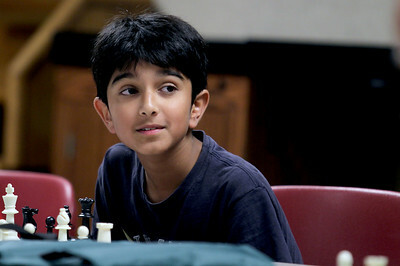 Khandeshi was the first person in three years to beat Cairone during the tournament. Sarah Nader - snader@shawmedia.com Bob Cairone of Crystal Lake makes his move while playing 17 consecutive games of chess during a tournament hosted by the Crystal Lake Public Library on Tuesday, June 26, 2012. 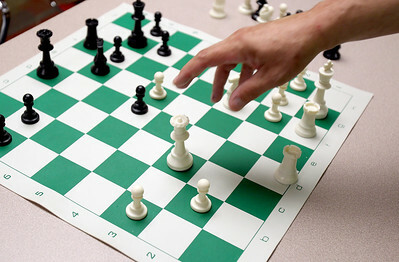 The Crystal Lake Library hosted seven weeks of chess workshops to help learn strategy, positioning and logic before hosting the tournament against Cairone. 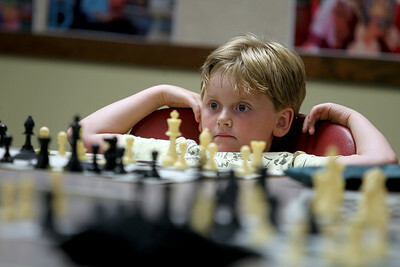 Sarah Nader - snader@shawmedia.com Paul Sweeney, 8, of Algonquin waits for his next turn while playing chess champion Bob Cairone of Crystal Lake during a chess tournament hosted by the Crystal Lake Public Library on Tuesday, June 26, 2012. Sarah Nader - snader@shawmedia.com A chess board is set up during a chess tournament hosted by the Crystal Lake Public Library on Tuesday, June 26, 2012. 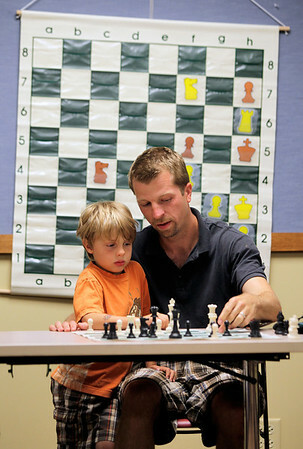 Sarah Nader - snader@shawmedia.com Jack Kerth, 6, of McHenry helps his dad, Dave, make his next move while playing chess champion Bob Cairone of Crystal Lake during a chess tournament hosted by the Crystal Lake Public Library on Tuesday, June 26, 2012. 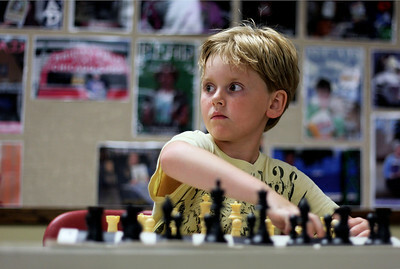 Sarah Nader - snader@shawmedia.com Jack Kerth, 6, of McHenry pounders his next move while playing chess champion Bob Cairone of Crystal Lake during a chess tournament hosted by the Crystal Lake Public Library on Tuesday, June 26, 2012. 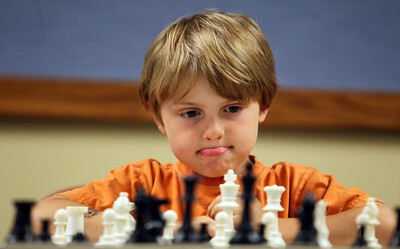 Paul Sweeney, 8, of Algonquin makes a move while playing against chess champion Bob Cairone of Crystal Lake during a chess tournament hosted by the Crystal Lake Public Library on Tuesday, June 26, 2012.